As a force, she is ferocious and untamed. It is not recommended to embark on any sadhana of Bagala as a beginner, or even as an experienced practitioner, without careful and close guidance by an adept experienced in working with her. If a practitioner’s heart is not pure, if they do not have clear resolve, if they select an innocent target, her energies can and will bounce back like a club strike in battle. Those who turn to her to solve their problems without facing their own responsibility will soon find themselves in deeper trouble, and the many unscrupulous people who try and use her power for their own gains, to the detriment of others, will eventually pay dearly for their folly. But she is also a fierce protector of the innocent, such as victims of lies and gossip, or of extortion, fraud, and other crimes. But these are not the heart of Bagala, for she is not a personality, but a force. As a force (śakti), she is ferocious and untamed. She holds deeper secrets for the sadhika, and nature hints at them. 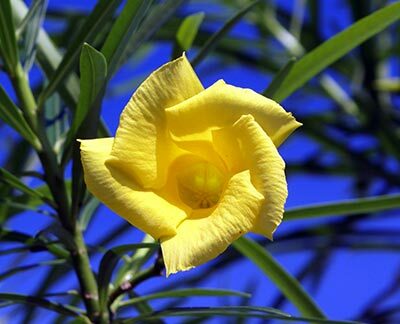 Her flower is the yellow oleander. When consumed carelessly, the oleander is a deadly poison that will stop the heart. When bees make honey from oleander nectar, it too is poisonous to humans. But in the hands of an adept traditional herbal practitioner, oleander can be used as a medicine that cures problems of the heart and many other ailments. Bagala is the pin that binds and unleashes wildly opposing forces. She is the knowledge of their relationship and origin in each other. She is the mastery of complexity.